What is a “TOUCAN” bicycle and pedestrian signalized crossing? 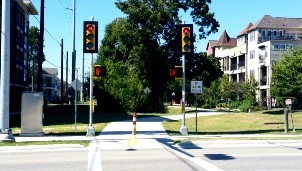 The TOUCAN (TwO GroUps CAN cross) is a signal system designed to provide a safe shared crossing for pedestrians and bicyclists. TOUCAN systems are placed at locations of heavy bicycle and pedestrian crossing activity and along roadways that are prioritized for non-motorized uses, such as “bike trails” or “bike boulevards”. A TOUCAN can be activated only by bicyclists or by pedestrians. Both use a push button to activate the signal. Bicyclists respond to an innovative bicycle signal and pedestrians get a standard WALK indication. Typically a wide crosswalk is provided for pedestrians and bicyclists to share. In some instances, separate, adjacent crosswalks may be provided. The system uses standard signals for motorists. 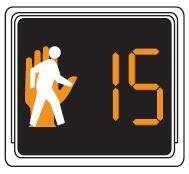 Increases safety by reducing crash rates at pedestrian-bicycle crossings. Fewer dangerous driver violations at pedestrian-bicycle crossings. Constitutes an alternative for crossings with traffic volumes not sufficiently high to warrant a regular traffic signal. 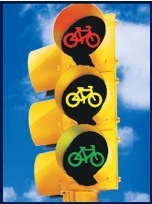 While serving bicyclists and pedestrians, traditional signal indications provide no difference to drivers as any other traffic signal. 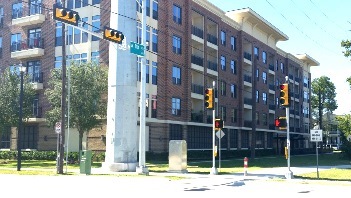 Pedestrians and bicyclists press the button and watch the pedestrian and bicycle signal heads across the street. 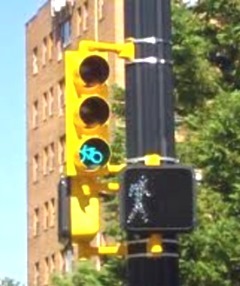 When it changes from a Don’t Walk symbol (orange solid hand) to a Walk symbol (walking person), and the bicycle signal changes from a RED bicycle symbol to a GREEN bicycle symbol, pedestrians and bicyclists begin crossing the street in the crosswalk. When the Walk symbol changes to a Flashing Don’t Walk with a countdown timer, pedestrians may continue crossing if already in the crosswalk but should not begin crossing if have not left the curb. Bicyclists observing a YELLOW bicycle symbol must complete their crossing path but not initiate it. When the pedestrian or bicyclist presses the button, approaching drivers will see a YELLOW indication for a few seconds indicating that they should reduce speed and be prepared to stop for a pedestrian and/or bicyclist in the crosswalk. This is followed by solid RED requiring drivers to STOP at the stop line. At this point, the pedestrian receives a WALK indication on the associated countdown timer, and bicyclists receive a GREEN bicycle symbol. During this period, motorists are required to STOP. Motorists receive a GREEN indication allowing vehicles to proceed through the crossing once they verify that pedestrians and bicyclists have finished their path across.